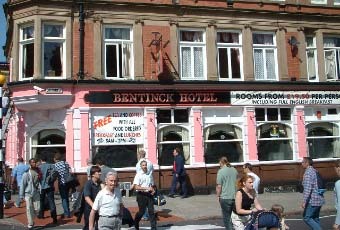 Stayed 1 night here when we visited Nottingham for a concert. Good location, nice room and excellent breakfast. Didnt have a drink as they didnt serve Guinness, only a couple of real ales and Spanish lager. We are now re-opened under new management. Closed, now a Starbucks. No great loss. Bog standard pub. Did have London Pride on my last visit. Popular with travellers waiting for trains but also some of the unwanted sort as well. Does get full of football fans on matchdays. A very basic hotel which advertises bed and breakfast but provides no breakfast, a fact I was not informed about until I asked what time breakfast started, too late then! There were 3 beds in my room, making it very cramped, no wonder there was little other furniture. The shared bathroom was clean but scuffy. A deposit was required for the key but when I tried to return the key and redeem my �10 deposit there was no one on duty. I had to wait almost three hours, until 10.30am for a member of staff. By which time I had gotten hungry and had to find somewhere to eat, I requested a refund for my meal but was refused. I did not use the bar as I was told that they would probably close about 9 or 10pm as it wasn't very busy. I would advise anyone to stay clear of this establishment.